On Being Tall: If The Shoe (Doesn’t) Fit. There is an extremely limited pool of men who are taller than me (although luckily I found an amazing one so this is no longer a concern 😉 ;-)). None of these things really bother me (unless it’s that time of the month, and then you better just watch yourself before you try to say something rude to me in the grocery store line. You’ve been warned, strangers of the world!). My height can be very intimidating (which comes in handy when dealing with opposing parties, jerkfaces, and strangers on the street when walking alone at night). Both of these lists can go on and on. The point is: I’m comfortable being tall, and I like it. However, the one thing that can send me into a sudden pit of anxiety and despair is attempting to shop for shoes. Unfortunately, several weeks ago, Ellie chewed the toe off my only pair of “go to” shoes for dresses. Ever since, I’ve been desperately searching for a pair of shoes because I’m going to a fancy-pants wedding next weekend and I need fancy-pants shoes. Unfortunately, the only shoes I can find that could possibly work are shoes with huge 4″+ heels. Besides the fact that I do not feel the need to be 6’8″, that type of shoes presents several other serious issues (see notes above about tripping and hitting my head on things). Yesterday I went to Nordstrom Rack with a friend who wears a size 8.5-9. She had several AISLES of shoes available to her. After looking at the couple of hideous pairs of shoes available in my size, I felt a wave of anxiety come over me, and I contemplated whether I needed to find a paper bag to breathe into. Especially after hearing her say something along the lines of “it is so frustrating having all these awesome shoes available but nothing to wear them to!” I can’t imagine how difficult that must be… as I sit and look at the 10 pairs of shoes available in my size, which consist of shoes for trannies and middle aged psychologists who like to express their individuality through fugly shoes (excuse my french ;-)). Why, in this internet age, does it have to be so stinking difficult to get a decent pair of shoes in a size 13?! I understand every store not carrying tons of 13s because it wouldn’t be very profitable. But what about making that size available for all shoes on the internet? It’s seriously the only thing that sometimes causes me to rage out about being tall. To be fair, it used to be impossible to find anything but boy shoes in my size, and now I do have quite a few pairs of very feminine shoes that go with my work clothes and casual clothes. But I don’t get the luxury of finding a particular pair of shoes to match certain outfits or dresses. It’s more like: find a pair of shoes that fit my feet and are not hideous, and then look for the clothes to match. I’ve been browsing Nordstrom.com, Zappos.com, and Barefoottess.com for weeks and I can’t find any shoes that would work with a cocktail dress with a reasonable heel height (not to mention browsing for shoes for the wedding since practically the day I got engaged). Finding the right pair of shoes for me is like discovering the a sunken ship full of buried treasure on the ocean floor. I stand out enough without wearing flipflops or man shoes to a “black tie optional” wedding. Come on, shoe gods! Help a tall girl out and magically make some cocktail-attire appropriate shoes appear on the internet in a size 13! Somehow Dave convinced me that participating in a March Madness bracket pool this year was a good idea. Let’s see… I know pretty much nothing about basketball, and especially nothing about any college basketball teams. So what would be a good idea? Attempting to predict the winners of 63 college basketball games. Unbeknownst to me, it turns out the two teams I put in the final are currently ranked #1 and #3 in the country. The only thing I did know for sure about March Madness is that there are upsets, and I understand upsets to mean a lower ranked team beating a higher ranked team. So I was pretty sure my final two picks would not make it to the end, but I refused to change my bracket and upset my very scientific method. Besides, what did I care if I lost? I picked Norfolk State over Missouri because Norfolk State was green and yellow which reminded me of the Oregon Ducks. Also, I have no idea what exists in the state of Missouri, but I have been to Virginia. Not exactly a winning strategy, y’all. But guess what? Norfolk State, a #15 seed, beat Missouri, a #2 seed, in the round of 64. I was the only one in my bracket pool who chose Norfolk to win that game. Also, of the first 9 games that happened, I picked the right winner for all of them. All of a sudden, I became obsessed. I am normally not a competitive person at all. But I have somehow lost my mind over here. It drives me nuts being at the bottom of the bracket. I don’t mind losing, but I don’t want to be the biggest loser. Also, if I am the biggest loser, I don’t want to lose by a lot. Unfortunately, my strategy for picking teams has me poised to lose by a lot. All of a sudden I care way too much about something that I didn’t give a second thought to (or even a first thought) a week ago. I keep refreshing the ESPN page on my phone, and turning every game on for the last 5 minutes and almost having a heart attack every time as the team I chose to win either wins or loses by one freaking basket. They should have a disclaimer for this thing because I’m pretty sure my heart might give out. The craziest thing about all of this is that I have sooooo much else to be dealing with right now. My actual job and planning my wedding just to name the obvious. But let’s see… It could also help to grocery shop, get Ellie’s nails trimmed, find a dress for the wedding I’m going to in two weeks, work out, finally draft all of those travel posts I’ve been intending to write, read one of the million books on my “to read” list that I “don’t have time to read.”… But no my friends. None of these things matter right now. I found myself kind of hoping that Kansas would just lose last night and put me out of my misery. But then when I was watching the final 5 minutes of the game* and I was like “NO THEY CAN’T LOSE!” And luckily or unluckily they did not lose, and I am destined to be obsessed for at least another week. Adventures in Invisalign: It’s Been One Week Since My Teeth Were Free. I mentioned in this post that I was recently fitted for molds for Invisalign. Despite the fact that I am a nearly 6’4 woman and have lived 27 years with fairly jacked up teeth, I surprisingly do not have low self esteem. I have hated my teeth, but it’s never made me hate myself. In fact, the only time it makes me feel awkward/insecure is when someone is all, “why don’t you ever smile showing your teeth? !” or “You should smile showing your teeth. It will look better!” No, it will not look better. It looks awful. And the only time I ever see pictures of myself and cringe is when I see pictures with my teeth showing (ok, and certain awkward angles where I look pregnant and/or obese). At some point a couple of weeks later, my dentist mentioned buttons. Buttons? What?! “Don’t worry…” she said. “They’ll be the same color as your teeth and barely noticeable.” I had never heard of buttons, but tried to tell myself it would be ok. I did a little research on them, and it does make sense that I would need them. Then, last week my aligners finally came in and I went in to get my first set. I was super excited to get going because my wedding is coming up, and I’d like as much progress as possible before that point so that I’ll feel more confident about really smiling for pictures. It turned out I had to have TWELVE buttons put on my teeth. Including SEVEN across my front teeth. And “barely noticeable” is a joke. They are only barely noticeable if you are (1) blind, or (2) standing 50 feet away. Basically, I look like I’m wearing clear braces, but without the metal brackets. I almost passed out when I looked at myself in the mirror. Technically, they are the same color as my teeth and they really are not horrendous, but when I looked in the mirror I am pretty sure I saw some creepy cyborg creature looking back at me. I was pretty depressed about it for a few days. I did not want braces because I knew it would make me more self-conscious about my teeth. People really stare your teeth down when you have crazy attachments all over them. Also? The main reason I wanted to get something going now was to look better for the wedding. I even explained that to my dentist. If she had told me that I would need 12 buttons on my front teeth, I would have seriously reconsidered. Who cares if my teeth look a little straighter if I have bumps all over my teeth? That’s like getting a nose job right before your wedding and still having the bandage on in the photos. Sure, your nose is technically better under the bandage, but you might as well have had your big honker in the photos rather than a bandaged nose. Is that a weird analogy? I was feeling a little misled. Sure, it was partially my fault for not doing thorough research, but my dentist seriously said NOTHING about the possibility of buttons at my consultation. And I even told her that the sole reason I was interested now was the wedding. And she even offered me free zoom whitening before the wedding as a wedding gift. Ultimately, I don’t think they were trying to mislead me, and I think the staff at my dentist’s office are super nice, but I really think buttons should be in a mandatory disclaimer in consultations. People think Invisalign means invisable (go figure!). I have never seen buttons mentioned or shown in the commercials. You hear that dentists and orthodontists and Invisalign corporate people?! Tell your customers they might have to have buttons, because they likely have no idea! Despite my initial freaking out, after about a week now, I don’t really mind the buttons. I really wish my dentist had told me and/or I had found out on my own beforehand, because I may have given more consideration to traditional braces if I had known. However, there is the perk that you can take the aligners out and eat/drink whatever you want. So the small silver lining I guess is that I can still drink coffee and wine and chew gum to my heart’s content… for the whopping 2 hours total per day that I’m allowed to have these babies off 😉 Also, I don’t have to worry about getting anything stuck in braces. In other words, I’ve basically convinced myself that this invisalign thing isn’t so bad. Also, after a few days of mourning, I called the dentists’ office to ask if there was anything they could do because the thought of having the buttons on in the wedding was really upsetting, and they said they could take the buttons off for the wedding. Such a relief! Crisis averted, y’all. My dog likes to kowabunga off furniture whenever she enters or leaves a room. We’re working on it. 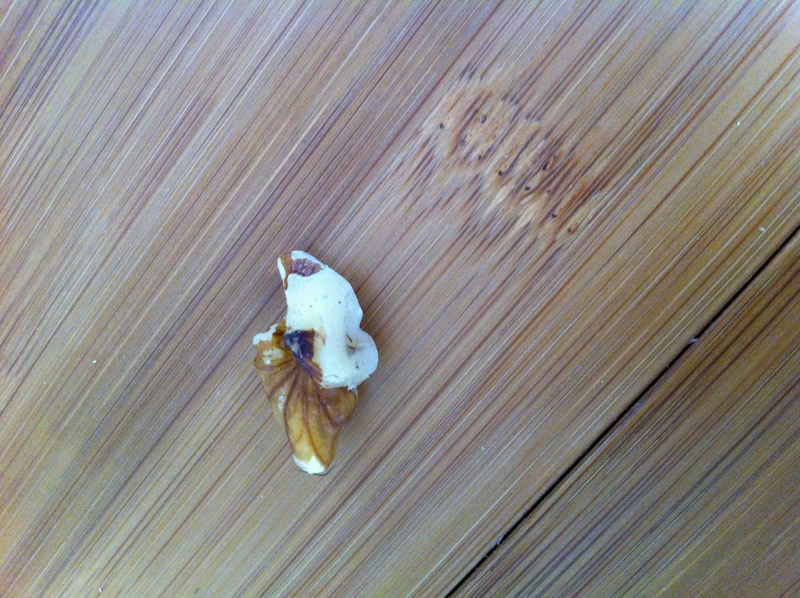 But in the meantime, this is bad news bears for wood laminate floors in a rental house. Having visions of having to pay to completely replace the floors when it’s time to move on, I googled whether there was a way to remove/lessen light scratches in wood or wood laminate flooring. I found an e-how post explaining that you can remove scratches by rubbing a “meaty nut” such as an almond or walnut back and forth across the scratch. The article even explained how to crack a nut open, for those of us who have somehow made it to the point in our lives where we have a home with wood floors but have never had the opportunity to use a nutcracker (??). I’m going to be honest: I really didn’t think something this simple could work. Especially because the article went through the trouble of explaining how to crack a nut. I was pretty sure whoever wrote that post wrote it for us gullible folks, laughing as they imagined all the poor suckers like myself rubbing walnuts into the floor to no avail. I didn’t have any fresh nuts still in the shells, but I did have a big bag of walnuts from Costco. 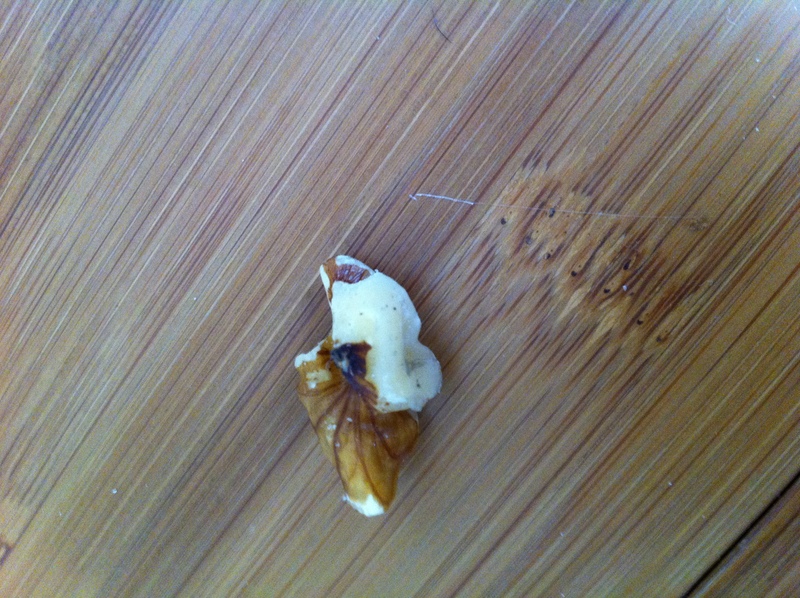 I pulled a walnut out, and got down on the floor to try it out. Turns out it was not a joke. It works! It’s like magic! I can feel my stress-induced hives receding with every disappearing scratch. It’s a christmas miracle! The trick doesn’t work for actual dents or deep scratches, but it works like a charm for light surface scratches! This has got to be the greatest discovery since whoever it is found the moon, right? In related news, wood laminate floors are supposed to be “more durable.” More durable than what? Lining your floor with cupcakes? I swear every accidental drop of anything causes a little ding or scratch. I’m walking on eggshells over here until I have time to buy some rugs. Whirlwind Southern Tour Part I: The Southern Mount Rushmore. 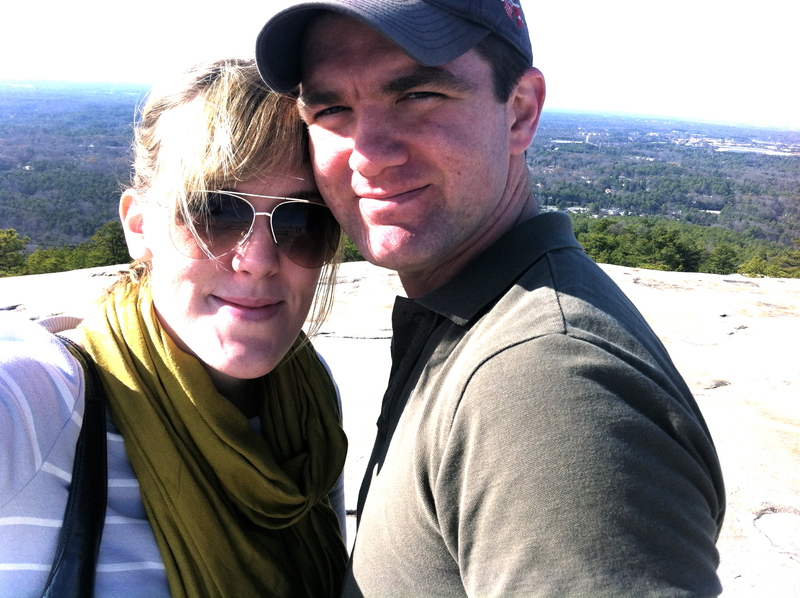 Back in December, Dave and I did a whirlwind tour of the south for Christmas (Atlanta, Pensacola, and Biloxi in a week). We left the dogs with a dog sitter, and flew to Atlanta to meet up with Dave’s parents who live in McDonough, GA, Dave’s hometown. 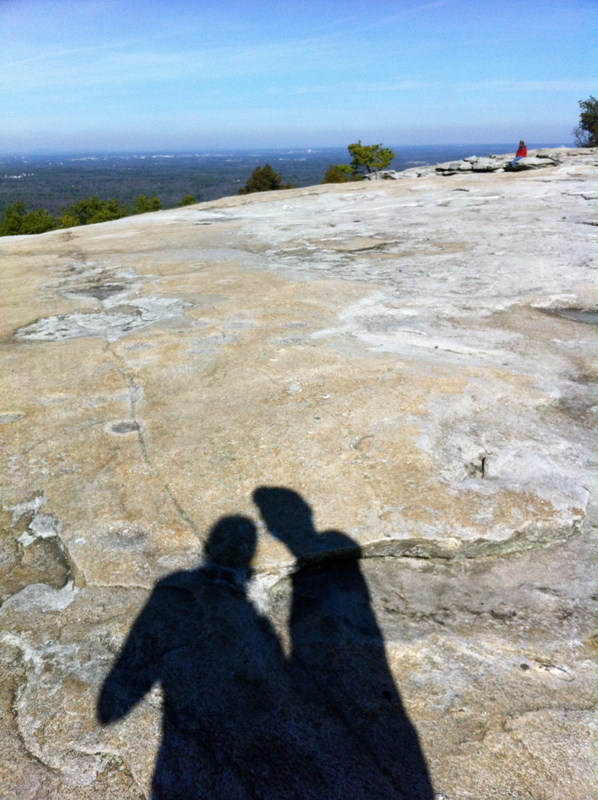 On the first full day, Dave, his mom, and I drove up to Stone Mountain. 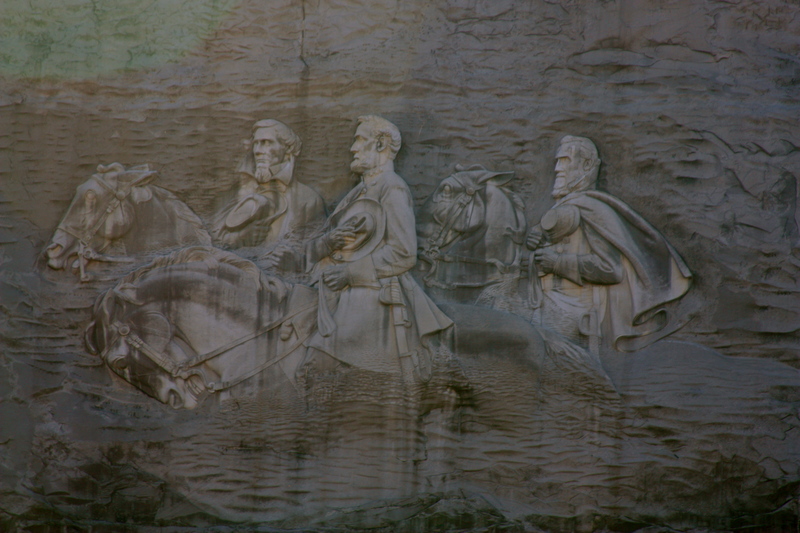 I’ve heard it billed as the “Southern Mount Rushmore” because it has carvings of three Confederate political figures in the side of the mountain. Stone Mountain is a quartz monzonite dome monadnock in Stone Mountain, Georgia, United States. At its summit, the elevation is 1,686 feet (513 m) amsl and 825 feet (251.5 m) above the surrounding area. 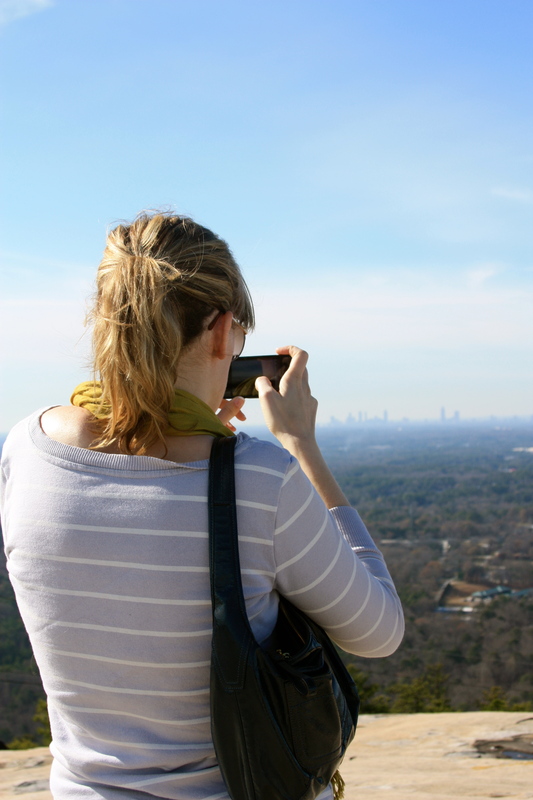 Stone Mountain granite extends underground 9 miles (14 km) at its longest point into Gwinnett County. 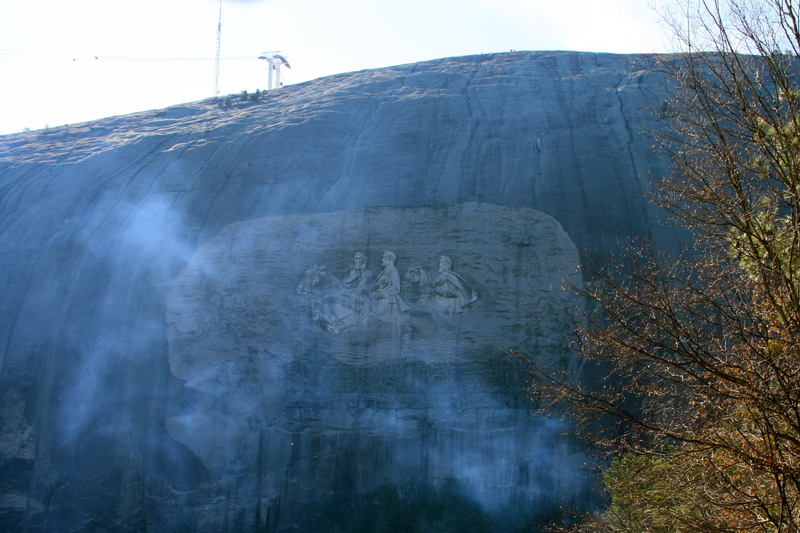 Numerous reference books and Georgia literature have dubbed Stone Mountain as “the largest exposed piece of granite in the world”. This misnomer is most likely a result of advertisement by granite companies and early park administration. Stone Mountain, though often called a pink granite dome, actually ranges in composition from quartz monzonite to granite and granodiorite. 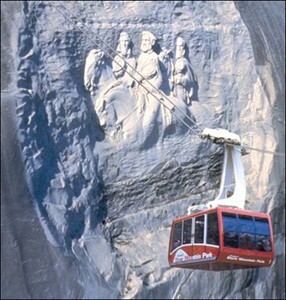 Stone Mountain is well-known not only for its geology, but also for the enormous bas-relief on its north face, the largest bas-relief in the world. Hey, so if Confederate icons aren’t your cup of tea, you can appreciate the fact that it’s the largest bas-relief in the world. That has to be a way cooler thing to check off your bucket list than seeing the corn palace, am I right? There are tons of things to do there. 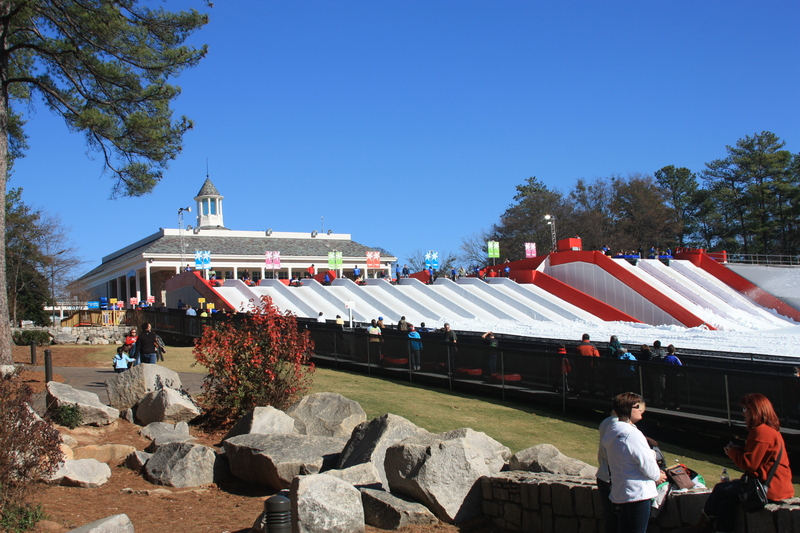 When we went, there was a winter festival going on and they were pumping snow to make a fake mountain side for inner tube rides. We walked around and then took the summit skyride to the top of the mountain. For $9, you can take a roundtrip skyride to the top. 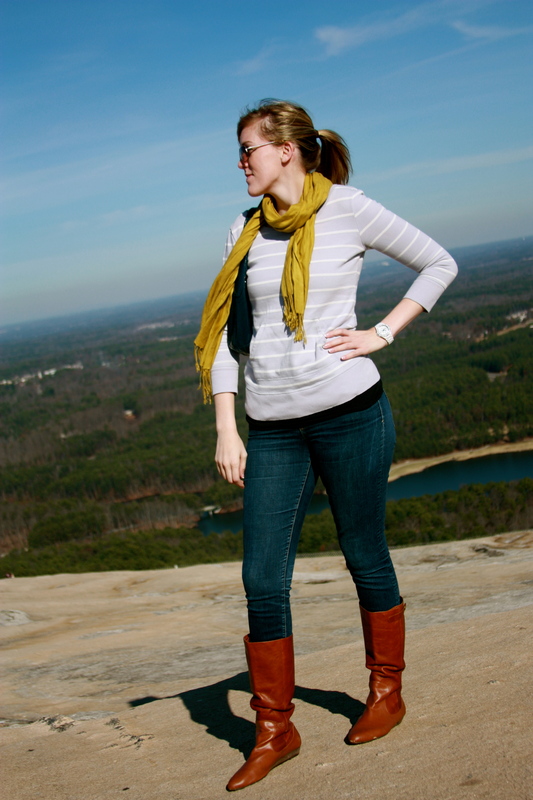 You can also hike to the top for free, but this girl was wearing leather boots, and those boots were not made for hiking. The skyride totally brought me back to my Switzerland adventures (for some reason the pictures don’t show up anymore on the posts. Boo!). The view from the top was GORGEOUS. 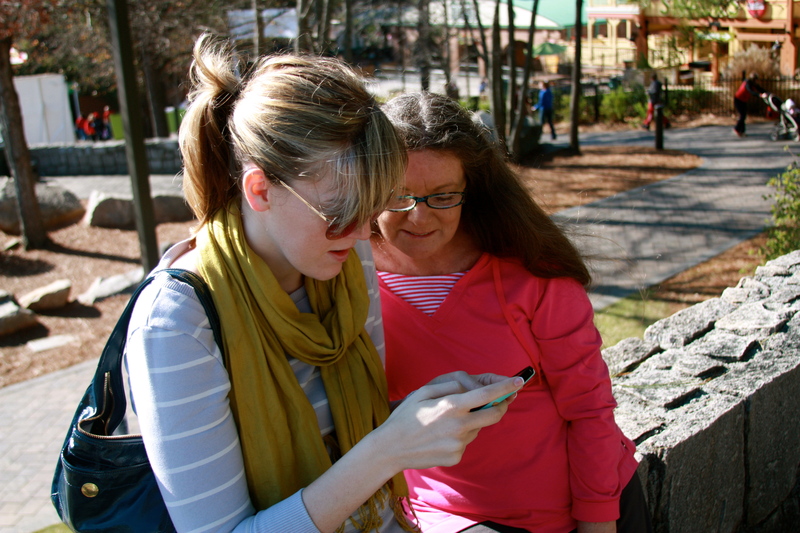 Even here, Dave is taking a picture of me and his mom, looking at the pictures he is taking… of me. Haha. This was back on the ground though. Have you heard of Eye-Fi memory cards? 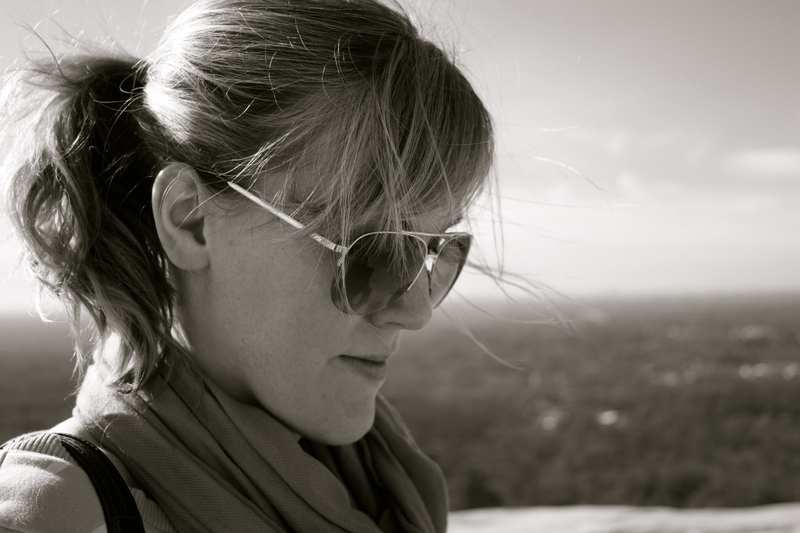 He has one in his fancy camera, and it is wirelessly sending all the pictures he takes, as he takes them, to my iPhone. How crazy is that? It will also wirelessly send pictures to a computer or iPad. I loved Stone Mountain so much that we have decided to have our engagement pictures taken there when we go back to visit in May. 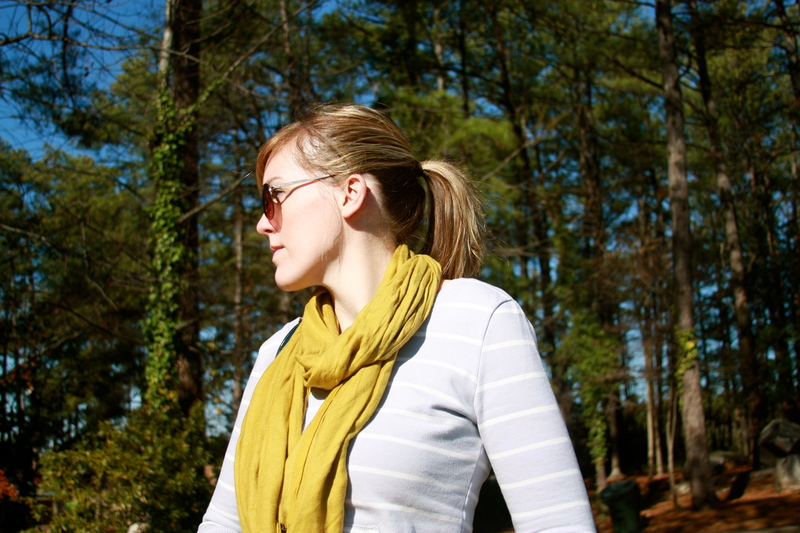 I also plan to tell all our wedding visitors about it so they can be sure to visit if they are looking for fun things to do in Atlanta. So I’ve already fallen off the blogging wagon again. I swear this thing is like working out. Once you miss a day, it’s so easy to miss another day, and then all of a sudden it’s been six months since you’ve been to the gym and your jeans are busting at the seams. Literally. Not that I would know ANYTHING about that . . . (Note to self: find 30 Day Shred DVD). I have been SO busy lately. And on top of being busy, Ellie (yes my dog) has been in some weird restless sleep mode where she finds it necessary to “readjust” every hour in the middle of the night which involves walking directly on me and rustling the covers for several minutes to get them JUST right. I feel bad making her sleep in a kennel but I am pretty sure I will die if I don’t get a daggum full night of sleep soon! I remember awhile back I wrote a post about how I am all these other things besides just a lawyer. And someone commented something to the effect of “how do you find any time to do anything besides work? !” And the thing is, there are definitely time periods that get very busy at work and I don’t really have time to do much else but work. And if I do have a few moments of spare time in the evenings, all I want to do is sit on the couch with a glass of wine and zone out to HGTV. But what I’m learning through these waves of slow and crazy busy times is to take full advantage of the slow times. When you are new to a firm, it is scary to be slow. Once you’ve been through a few crazy busy times, you learn to embrace those slow times as much as possible. Also, once you’ve been through a really bad crazy busy time (i.e. that one time where all I did for months was work and barely sleep and I broke out in hives), you learn to draw the line sometimes and say no. You also learn that you need to keep certain things even in the busy times to keep your sanity, like working out and maybe even blogging.